I wore Butterfly Kisses this past week and I must say I was pleasantly surprised that I loved it so much. 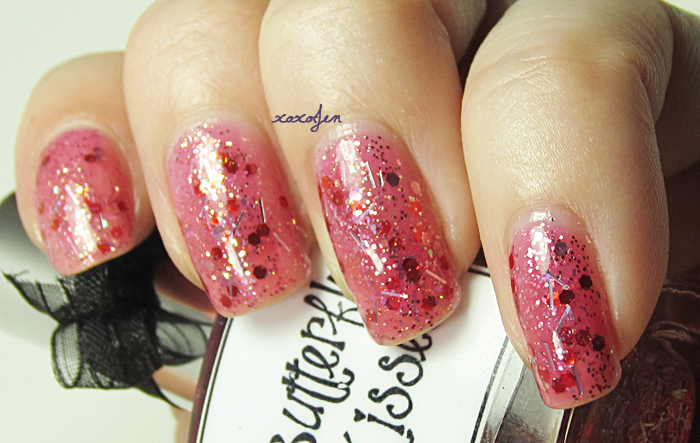 See, I'm not much into red polish but this one won me over with its lovely pink jelly base and sparkly glitter! In the bottle I thought it would have a really bright red base color, but I got a surprise! When I applied the first layer it went on so well, no digging for glitter or fussing with keeping it off the surrounding skin. The brush was very accurate and the formula was just the right consistency for good control. I was concerned at how sheer one coat was, but as soon as I applied a second coat it was opaque enough for my liking. 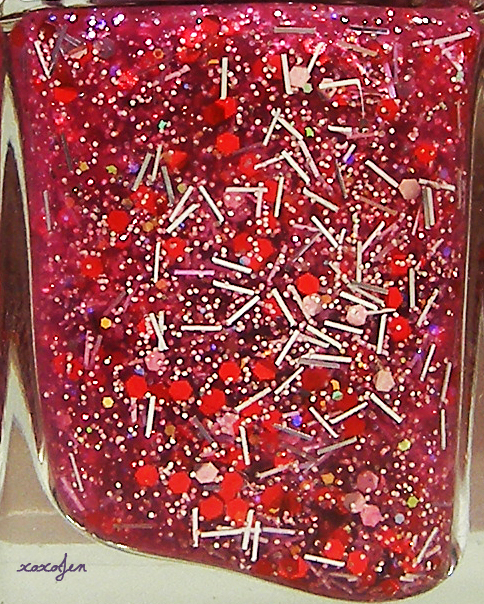 The pink jelly base is packed full of sparkly red and pink hexes, smaller holo hexes, tiny holo and even tinier silver glitter and fine silver bar glitters. The first photo is with two coats of polish, a layer of Gelous and a layer of Seche Vite. The second photo is with Hard Candy's matte top coat. So far, I have tried twelve of Pam's polishes and every single one of them has been a joy to apply and wear. Have you tried Whimsical Polish from Pam? What is your favorite? Butterfly Kisses.....is gorgeous!! I don't have this color of Whimsical Polish from Pam, BUT I do have all the rest of her collection. My favorite? I can't choose just one of hers...too many loves!! She also has the best customer service. One of the best if not the best shop out there. Thank you so much for the kind comment! I'm with ya, I cannot choose a favorite!